A beachside holiday house with all the comforts of home. 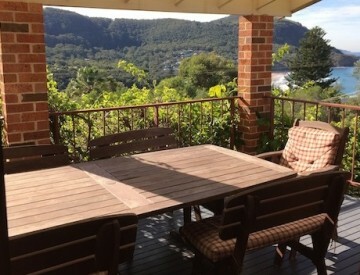 Stanwell Park Beach Cottage is a three bedroom house available for holidays or weekends away. 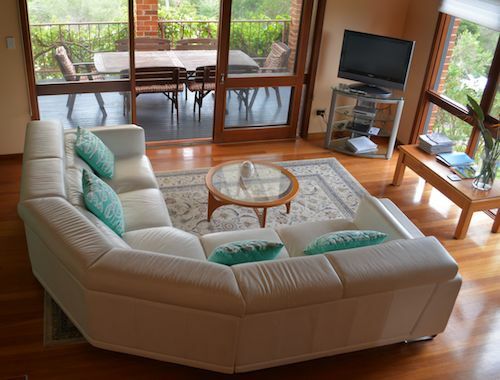 It is especially suitable for families and friends looking to share a holiday together. It also caters to couples looking for some quiet time and relaxation near the ocean. 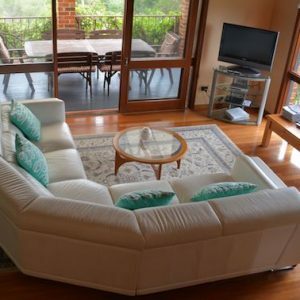 Stanwell Park, being approximately one hour from Sydney, is convenient to get to, but at the same time it is also a quiet, beautiful, carefree environment with little commercialisation. To employ an oft quoted phrase, it is ‘a thousand miles from care’. 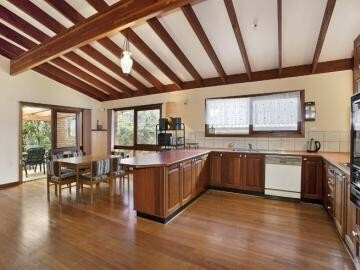 The house itself, is a large and spacious split-level brick veneer with cathedral ceilings. These features enable the house to be light and airy. 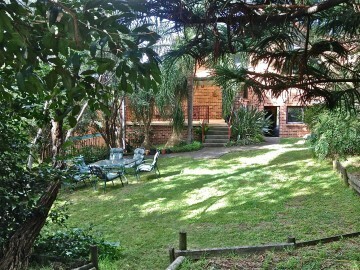 The Stanwell Park area seems to enjoy a micro climate and can often be unusually warm in winter, until the sun recedes. There is gas heating for the winter months. 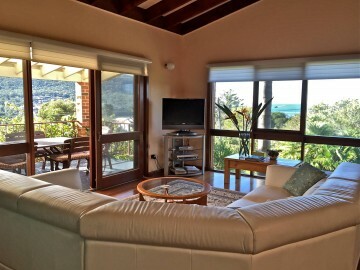 Stanwell Park Beach Cottage provides accommodation for up to 7 adults. There is a foldaway bed for a child if required. 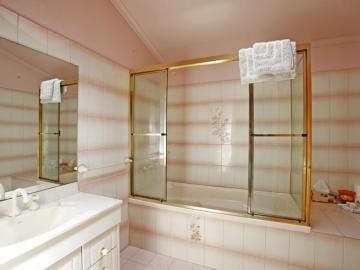 There are two bathrooms (one an ensuite connected to the main bedroom). 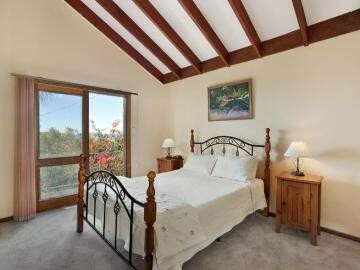 The property overlooks the ocean and is only a five minute walk downhill, to the beach. The village shops are within easy walking distance and at cafes like ‘Sixteen Feet’ or ‘The Palms’ you can treat yourself to great coffee, breakfast or lunch. ‘The Stanny Food & Coffee Co’ is the general store and offers takeaway coffee and food. For those looking for a classy night out at a restaurant you cannot beat ‘Tumbling Waters’ at Stanwell Tops. Whatever you and your companions choose to do, either chill out and relax, or go sightseeing, there is something here that should meet the requirements of everyone. For those looking for cafes, restaurants, sightseeing, days out and even some adrenalin sports please take a look at our Explore page. We have a newly renovated, well equipped kitchen including dishwasher, microwave and the ever popular coffee machine! We understand that even when you are on holiday it’s nice to be able to check in with what’s happening with the rest of the world and so we offer Free Wi Fi to all that stay. There’s something really great about being able to take in the fresh, salty air on our deck. It’s not a holiday without a BBQ so we’ve got one all set up for you. With a Digital TV, CD Player and Stereo we have covered the basic amenities for home entertainment. In Winter, cosy up with our internal gas heating and take in the view from our comfortable lounge. For your convenience we have a separate laundry with washing machine and ironing facilities. When the kids say they have nothing to do, share a game of table tennis. There is a main bathroom as well as an ensuite for your use. Thanks. Great view! Thank you for providing a great family getaway. The best two nights of our Australian trip. Wonderful location with an incredible view! Thanks for a lovely place to stay. Great view. Relaxing location.